In this delectable, frothy, yet mostly decorative confection, three of Moliere’s beloved plays “Le Bourgeois Gentilhomme,” “The Misanthrope,” and “Tartuffe” are sifted together with a generous helping of Shakespeare in Love and Casanova added in for flavor. 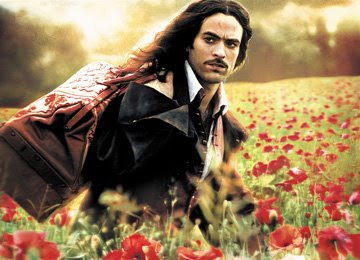 The result is an entertaining and gorgeously photographed although largely fictitious look at the famous French seventeenth century playwright Moliere or as he is better known throughout the bulk of the film, Jean-Baptiste Poquelin. Played by one of my favorite dark haired, dreamy eyed French actors, Romain Duris (L’Auberge Espagnole, Dans Paris), we first meet Moliere in 1658 after he’s spent thirteen years with his theatrical troupe entertaining citizens in the provinces and steadily building up such a reputation that upon his arrival, the king gives him a Parisian theatre to stage his latest work. The only catch is that the king has a weakness for comedies and Moliere, long tired of farces, desperately wants to deliver his audiences an epic tragedy but his mind is changed after a young woman pays him a visit and beckons him to go see her gravely ill mother. Moliere’s relation to the women and indeed their identity is kept hidden from viewers although it’s fairly easy to guess the facts only a half hour or so after the film ventures back to thirteen years earlier when struggling performer Moliere is arrested for failing to pay a large debt. His cry of “A plague on creditors; long live the theatre!” seems to fall on deaf ears until the wealthy M. Jourdain (Intimate Strangers star Fabrice Luchini) offers to cover his debts in exchange for acting lessons. Bewitched by the sharp-tongued young beauty Celimene (Swimming Pool’s Ludivine Sagnier) the married Jourdain wrote a one act play to win the fair maiden’s favor and in order to hide his hopeful future seduction from his wife, he asks Moliere to stay with him at his home under the guise of priesthood as Moliere must pretend he is Father Tartuffe. The clever script, which could have easily fallen into farce is saved by the talented Jourdain who earned a Best Actor award for his performance at the Moscow International Film Festival as he plays the entire thing straight, making the comedy both accidental and spontaneous while Jourdain balances his schedule of taking music, dance and painting lessons with his duties of husband and father thereby hiding his true passion for acting out of guilt for his intended affair. The lovely Laura Morante (Dancer Upstairs, Avenue Montaigne) stars as Jourdain’s wife who, suspicious of Moliere’s appearance and her husband’s sudden interest in the church, quickly becomes the target of the younger man’s affections as we find Moliere up to his old tricks of trying to win her over with earnest romantic words both written and spoken. While Moliere purists will no doubt feel dismayed by the film that appears to have been undertaken in the same spirit as the misguided fictitious biopic Becoming Jane about Jane Austen, Moliere succeeds where Jane did not by celebrating Moliere’s spirit in keeping the work as entertaining as one of his plots in this sumptuously photographed film which earned four Cesar Award nominations in its native France. Although it may not qualify as the proper Moliere nourishment, the end result is something quite close to a cinematic French dessert—scrumptious, luscious yet minus the calories of a French Silk Pie.